We’ve all heard of Aurora Borealis or the Northern Lights but have any of you lovelies heard of the Aurore Boréale crystal? Influenced by the ornate, corseted gowns and decorative broaches of the 18th Century Louis XVI style and inspired by the delicate light-reflecting qualities of crystal, each product in this exquisite color collection is like a tiny jewel. Featuring shades of petal pink, deep silver and a wide range of purples to create a luxurious and festive look for holiday. In the mid Fifties, inspired by the magnificence of Versailles, Christian Dior asked the Swarovski House to create a crystal that evoked the reflections of the sunlight going through the famous Galerie des Glaces in Versailles. This led to the creation of the Aurore Boréale crystal with its unique multi-colored reflections. For its 2009 Christmas Look, Christian Dior Parfums has collaborated for the very first time with the Swarovski House to create an exceptional Star Product using the legendary Aurore Boréale crystal : “Cristal Boréal”. The oval pendant, inspired by the shape of the neo-Louis XVI chairs that Christian Dior loved, is adorned with 52 Swarovski crystals of which 4 are Aurore Boréale. 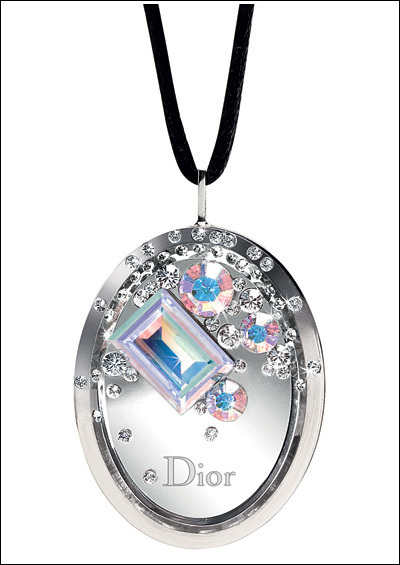 This pendant contains a crystal-effect gloss declined in one easy-to-wear shade: Pink Crystal. A true makeup jewel for precious iridescent lips. This jewel-toned eyeshadow feature light-reflecting qualities and subtle colors for a delicate, shimmering effect. Embossed with a “crystal pattern” effect. Available in “Precious Purple” and “Pure Silver . 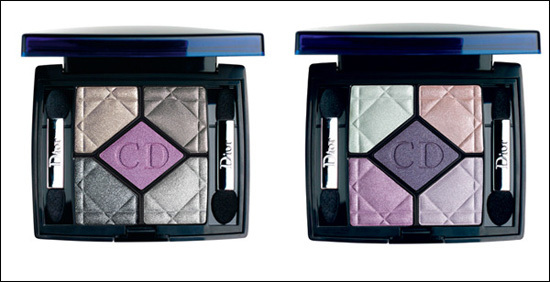 5-Colour Iridescent Eyeshadow, available in “Smokey Crystal” and “Precious Crystal”. Words cannot express how much I covet this entire collection! I’m a huge fan of pastels on the lids. When applied correctly, they really offer a beautiful yet subtle alternative to the “natural look”. For once, the model looks beautiful (as opposed to weird) in the promotional photos! Looking at her in the promo, actually makes me want to go out and buy this entire collection, right down to the silver nail polish she has on her nails. The packaging is heartbreakingly gorgeous as well! This entire collection strikes me as very decadent. The backstory is delightful, and even the name sounds beautiful. So to recap, impressive name, short history story, pretty colors, and bling’d-out packaging. Kudos Dior! This is why I’m a long-time fan. Other reasons why I think this collection is worth my upcoming paycheck, it’s Dior, it’s a Holiday Collection, and it’s Limited Edition. ‘Nuff said. You know what? I should have just led with that. Any of you lovelies find anything in this collection worth parting with your paycheck for? Do share!